Hey You Guuuuysss! 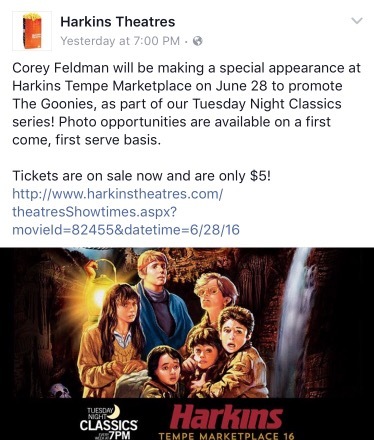 Fans of the 80’s hit film The Goonies will be excited to hear that Corey Feldman, who played the character “Mouth”, will be appearing at the Harkins Theater at the Tempe Marketplace on June 28th. 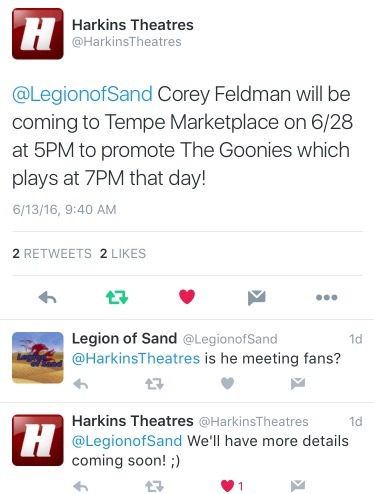 No details yet if he’ll be doing a Q&A or meeting fans but Harkins said they are working on the details. This makes two alumni from the film to stop in Phoenix this month as actor Sean Astin was in town for Phoenix Comicon earlier this month. Tickets are currently on sale for the 7PM showing of The Goonies. [Update] Harkins updated their FB page with into that there will be photo ops on a first come, first serve basis. Thanks to @larry_uu for the info.